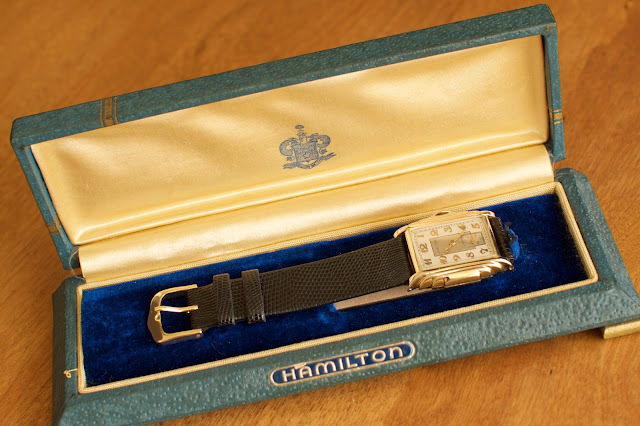 When my first retro/vintage watch arrived (a Hamilton Putnam, a gift from my wife) it opened up a new adventure of discovery, admiration, dreaming, tinkering and collecting. 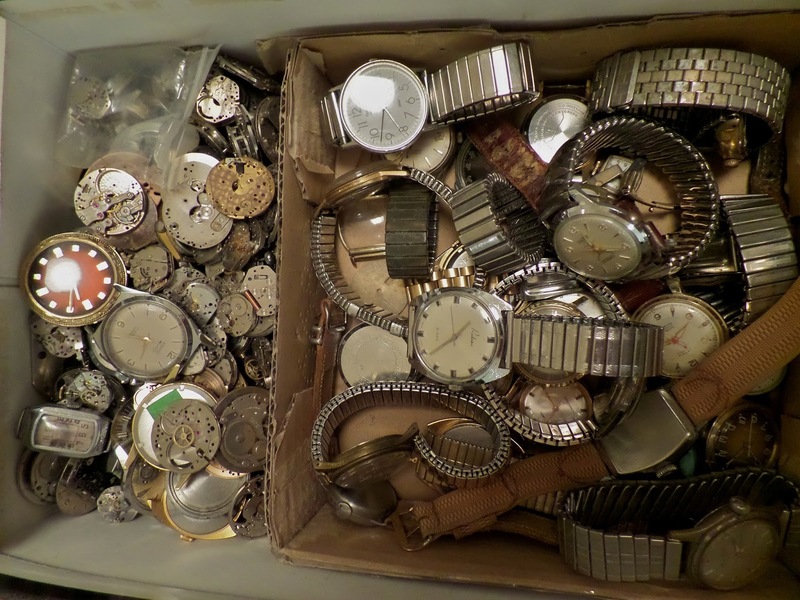 My first few years of watch discovery had no rhyme or reason. 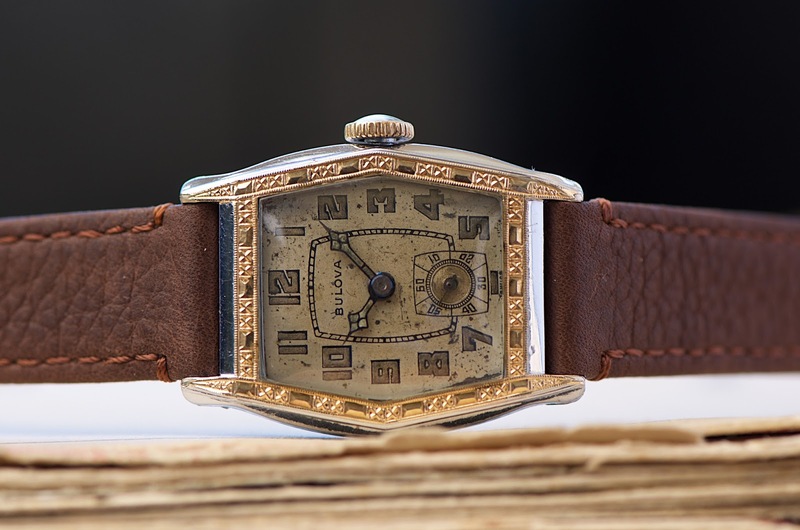 As a matter of fact, after that first watch it became an insatiable pursuit to find new watches of all shapes and sizes. Seems I found and bought just about anything those first few years. Different vintages, styles, price points; they were all of course, mechanical watches. I suppose in the early years most of my collecting was playing to an emotional satisfaction. Does that mean my watch collecting satisfies some other reasons now? Aesthetic? Intellectual? Preservation? Social? Not sure what my physiological motivation is but likely many. 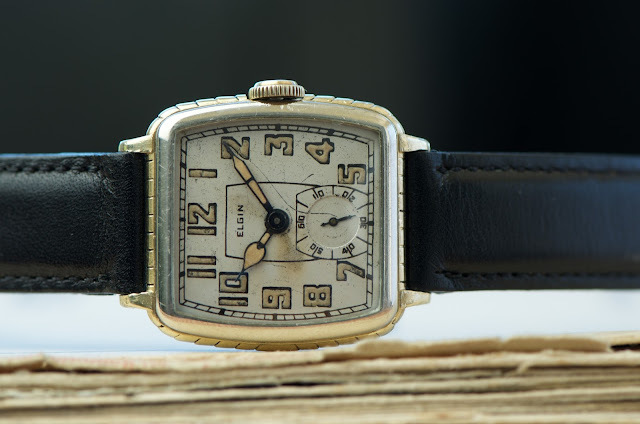 Jump forward a couple years, my experience with a watchmaker friend and honing my "tinkering" skills to today, my obsession for retro/vintage watches has not subsided but what I search for has. I think its only natural progress over time to fine-tune what it is in these watches I see and am looking for. I've read a lot, participated in various online forums, and am paying attention to the experts. A certain era, a certain style, a certain case type, and a certain maker. You can find a whole lot of combinations of those. That being said, my current interest includes the 1920s and 30s, deco, two-tone cases and Illinois watches. 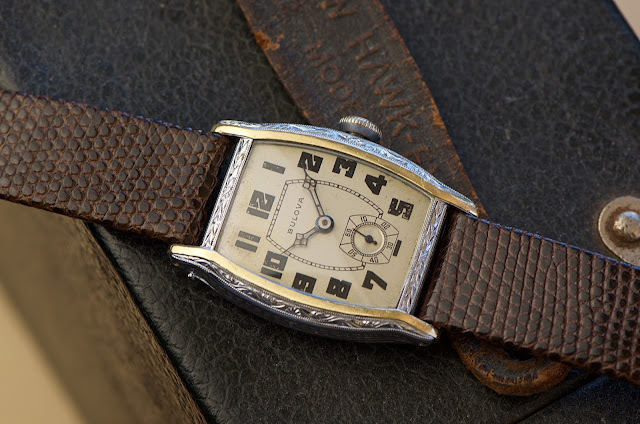 The Illinois watch above, the Townsman, hits both my refined criteria - the era and great deco engraved (or "chased") styling of the case. 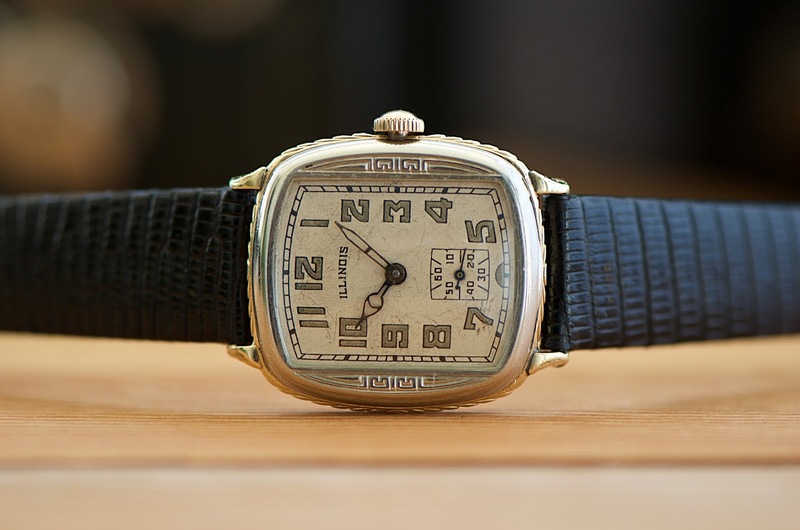 As I started looking at my growing collection of watches for a subject to blog about, I noticed an increasing number of 1920s and 1930s watches and a many with two-toned cases. 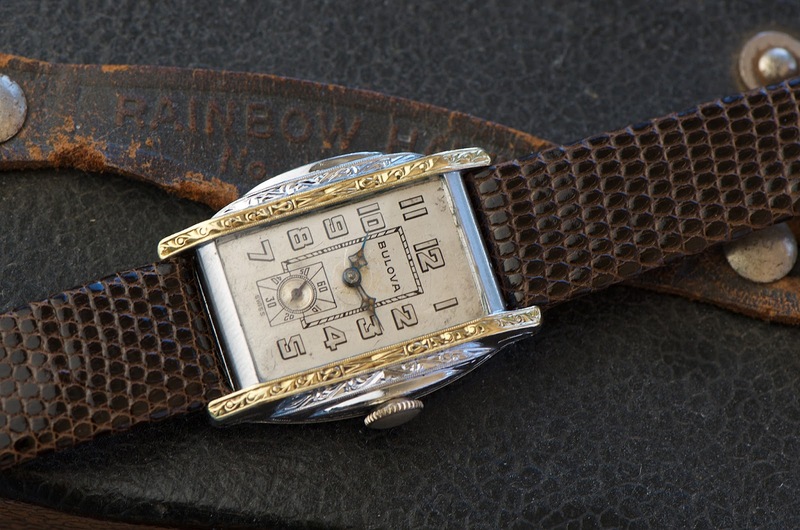 Take for instance the Townsman above, it has a white gold bezel and back and sandwiched between is a yellow gold centre. The examples below also incorporate two tones of gold in their cases. The Apollo, Gladiator and Sky King below all have a white gold case with a yellow gold strip on the front bezel. Like the Townsman, the Elgin Model E-12 below has a yellow gold centre sandwiched between a white gold back and a white gold bezel. While there are a number of materials watch cases are made of (solid gold, gold fill, stainless, base metals of all types, etc.) most of my collection consists of gold filled. Given my preferred era of collecting (and although stainless steel cases were around in the 1930s but did not become common place for many years after) its no wonder I have more gold filled watches than any other metal. While my tastes have been refined over the last few years, one thing remains the same - I'm still obsessed with mechanical watches. BTW, if you like what you read or see in my photography, post a comment. Is there something you'd like to see in my blog, let me know as well.